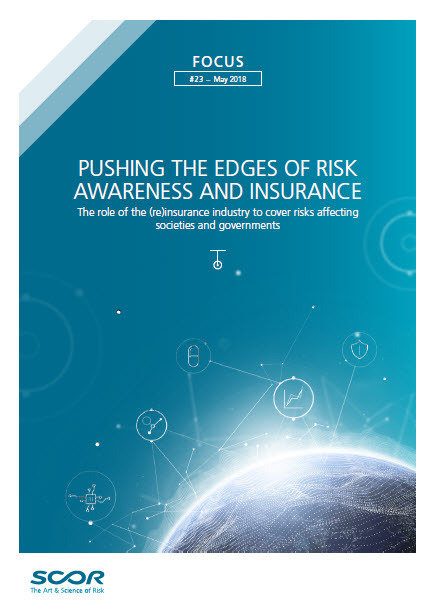 SCOR has published a new Focus newsletter based on the 2017 SCOR Annual Conference, “Pushing the edges of risk awareness and insurance: the role of the (re)insurance industry to cover risks affecting societies and governments”, which brought together all of the topics discussed over the past decade within a holistic framework. The main theme of this new Focus, “Pushing the edges of risk awareness and insurance: the role of the (re)insurance industry to cover risks affecting societies and governments”, is derived from the identification of a challenge in terms of sustainable development, and from our belief that, as a good corporate citizen, SCOR, along with its partners and the entire industry, should develop risk transfer solutions to the world’s major problems. Sustainable development rests on four elements –water, food, health and longevity, and infrastructure. Water is indispensable and is necessary to grow food – but populations are expanding, their wealth is increasing, and all the while their expectations are rising in terms of quality of life, quantity of resources, and guarantees of safety. Energy (oil) is no longer the world’s only critical natural resource constraint: the world is now facing a water challenge. A water challenge also means a food challenge. These two issues have a direct impact on health and longevity, and are accompanied by a context of increasing global pollution, the development of new diseases, and a higher risk of global spread of these diseases as climates become more suitable for disease-carrying pests. Water, food, health and longevity are intrinsically linked – not least by climate change. Moreover, a society that is growing and increasing its wealth also experiences higher demand for infrastructure and power. With this demand, it is necessary to address the issue of producing environmentally compliant and resilient infrastructure. Wealthy societies and even some emerging economies also face the problem of decommissioning or upgrading infrastructure that does not meet growing expectations in terms of quality and safety. The texts published in this Focus originate from the latest SCOR Annual Conference. For the last 10 years, the SCOR Annual Conference has reflected the major issues and challenges of the (re)insurance industry. Many of the issues highlighted by SCOR over the years are now reappearing in new and different forms, requiring us to learn from the past and adapt for the future. As an example, we discussed Capital Management in 2014. Today, insurers are still dealing with the requirement to optimize capital and to comply with increasing capital requirements, at a time when reinsurance margins are reducing and (at least in Europe) both regulations and accounting standards are changing dramatically. In 2016, cyber risk was our key topic and it remains one of the main challenges for the industry, not only in terms of providing cover and understanding the risk but more importantly in terms of managing the “silent cover” that exists in all businesses. The reinsurance industry’s issues tend to resurface regularly on a 5 to 10 – year cycle. These cycles illustrate the difficulty of our industry in terms of durably implementing solutions that would definitively solve an issue. It is more than ever necessary to form a consensus regarding certain principles for resolving matters as an industry. In their joint presentation titled “Risk and resilience of Infrastructures: how smart technologies can improve risk management”, Dr.